(Phys.org)—Researchers have demonstrated that the geometry of a natural spider web can be used to design new structures that address one of the biggest challenges in sound control: reducing low-frequency noise, which is the second most widespread environmental problem in Europe after air pollution. The researchers, Anastasiia Krushynska and Federico Bosia at the University of Torino; Marco Miniaci of the University of Le Havre; and Nicola Pugno at the University of Trento, Queen Mary University of London, and Italian Space Agency, propose a new approach to this problem in a recent issue of the New Journal of Physics. "This work provides a new promising approach to obtain low-frequency noise attenuation," Pugno told Phys.org. "The strategy is based on the design of acoustic metamaterials, which combine the advantages of a spider web-like geometry and the space-coiling approach of labyrinthine channels. This structure also provides a simple and reliable way to introduce tunability in sound manipulation, which is highly desirable for practical applications." As low-frequency sounds are characterized by long wavelengths, shielding these acoustic waves typically requires very thick, heavy structures that are expensive and impractical for most applications. An alternative approach is to use recently developed metamaterials. Whereas traditional acoustic barriers rely on the composition and thickness of the material to manipulate sound, metamaterials do this with their intricate subwavelength-scale structure. As a result, metamaterials can be very thin, yet may still effectively reduce and manipulate low-frequency sounds. In the new study, the researchers based their design on a new concept called labyrinthine metamaterials or "space coils," first proposed a few years ago. Labyrinthine metamaterials consist of layers of folded zig-zag channels rotated relative to each other, giving them a maze-like appearance. One such labyrinthine metamaterial is configured in the form of a spider web. The authors of the current study recently showed that this geometry is particularly efficient in attenuating (or reducing the intensity of) elastic waves. Now in their new study, the researchers modified the previously proposed labyrinthine metamaterial design by adding a square frame, so that the resulting structure resembles a conventional spider web, and showed that this simple modification creates air cavities that allow for variation in the widths of each channel in the web. By controlling the channel widths, the researchers showed that it is possible to tune the metamaterial's acoustic properties, including the way in which it disperses and reflects sound waves. 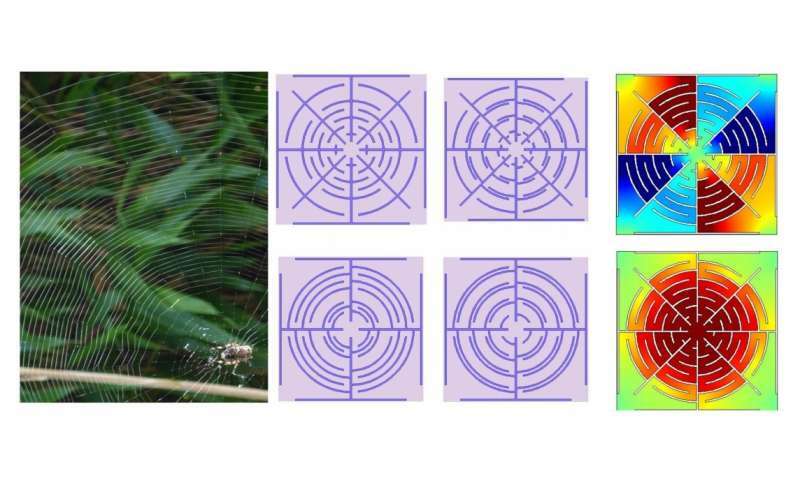 The researchers expect that the spider-web-structured metamaterial, which is designed to be made of aluminum, can be easily manufactured, making it potentially useful for a wide variety of applications that involve low-frequency sound manipulation. "Though similar geometries have shown promise for the attenuation of low-frequency vibrations, the developed metamaterials cannot be applied directly to seismic shielding, since they manipulate acoustic (airborne) and not elastic waves," Pugno explained. "Their applications include the control of low-frequency sound and noise isolation that remain challenging with traditional approaches, as well as transformation acoustics and sound focusing, such as in concert halls."